So i discovered this web comic, Able and Baker, today and have read many of them while on hold making phone calls, and other such mindless tasks. They are great. The bipolar gerbil like creature is by far the best. Banter between him and Bunbun from Sluggy Freelance would be priceless. So the crazy world of Jim Burgess gives you insight to the lives and intricacies of being a lab animal (so other characters include the sheep, monkey, prof, + prof’s daughter). AND he has designed this AARGVARK shirt. 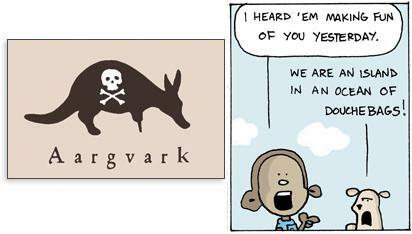 When aardvarks go rogue, paint a skull and crossbones on their back, and get a peg leg… beware?